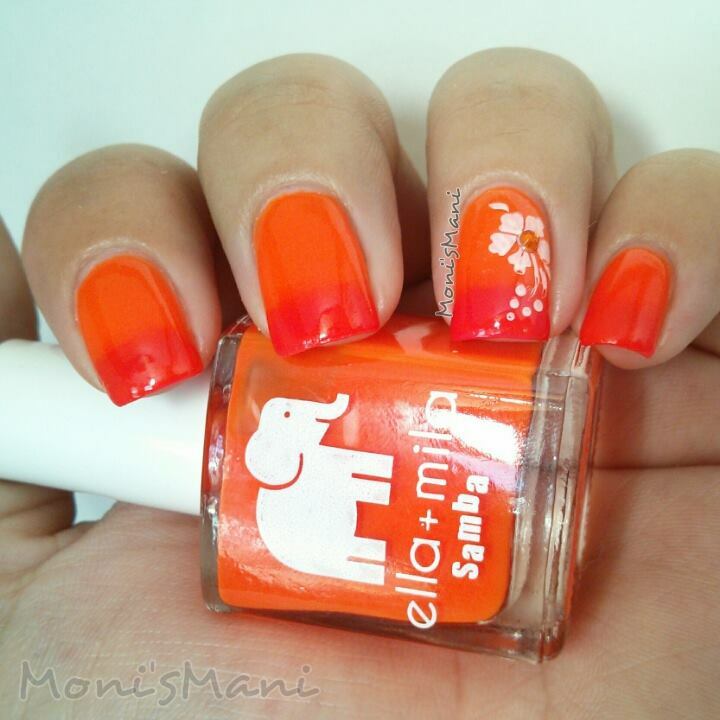 Today I’m bringing you a review of three of the colors from the ella+mila Samba collection. As you might already know this is a brand I’ve worked with before and I was really happy and flattered that they would consider me for swatching again! 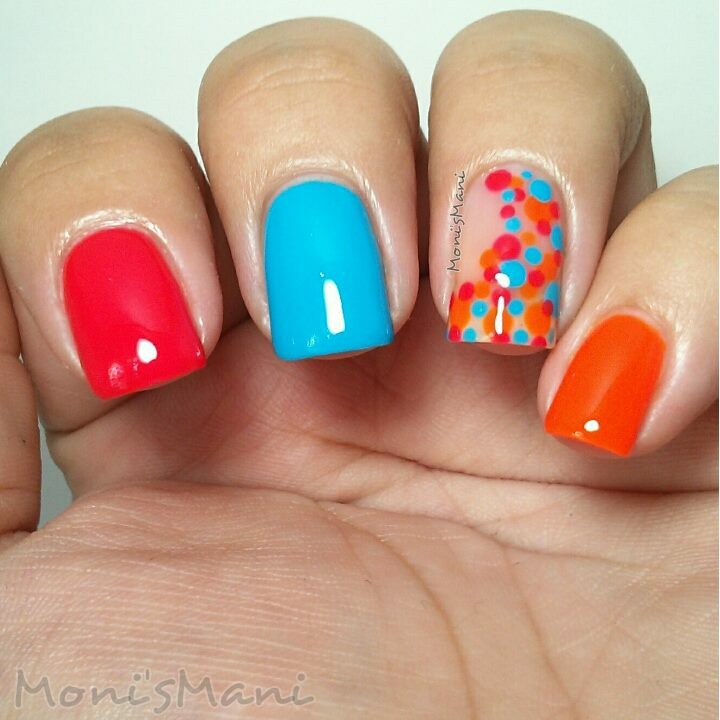 *The first thing you’ll notice about these polishes is how absolutely gorgeous and VIBRANT they are! they are hard to ignore but somehow manage to not be “loud”, is that even possible? yes it is! 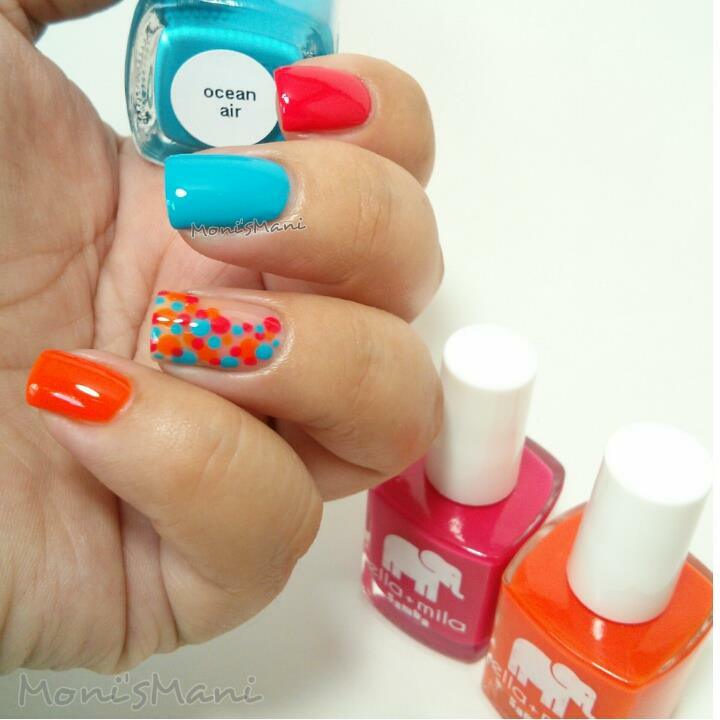 In the mani below you see MY all time favorite dotticure, this is actually a manicure I did right after opening the box, I needed to swatch them so I went for it and the accent nail design just came naturally. 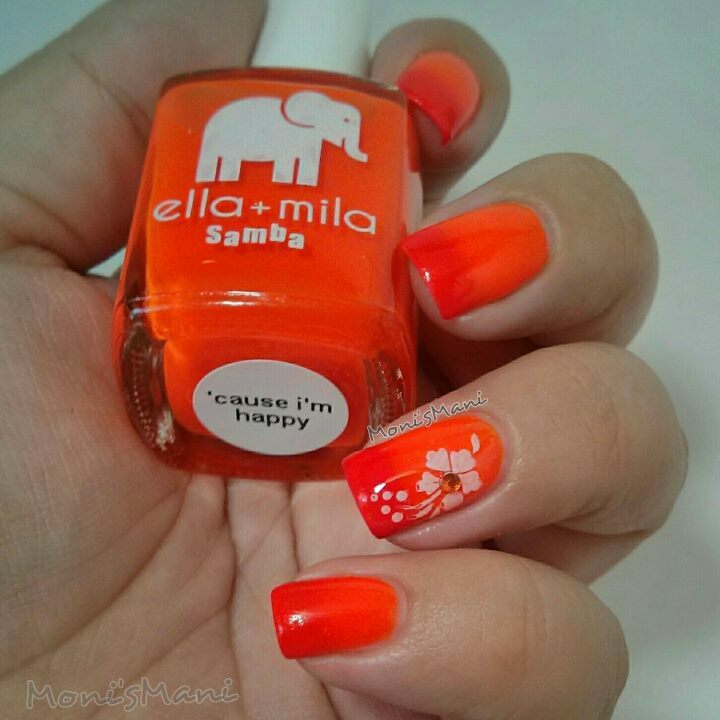 *cause i’m happy- is a beautiful orange neon crelly, fast drying, smooth formula, loved it! 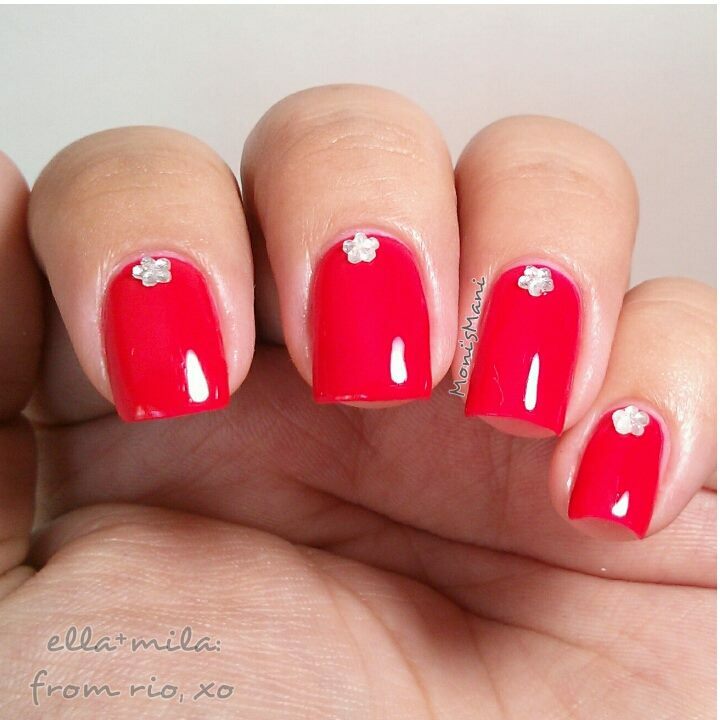 for this mani I did a subtle sponged gradient over it using “from rio,xo” I really liked the effect, and I absolutely NEEDED to do a Hibiscus mani this summer so I stamped this baby and added a little rhinestone as a special touch, what do you guys think? 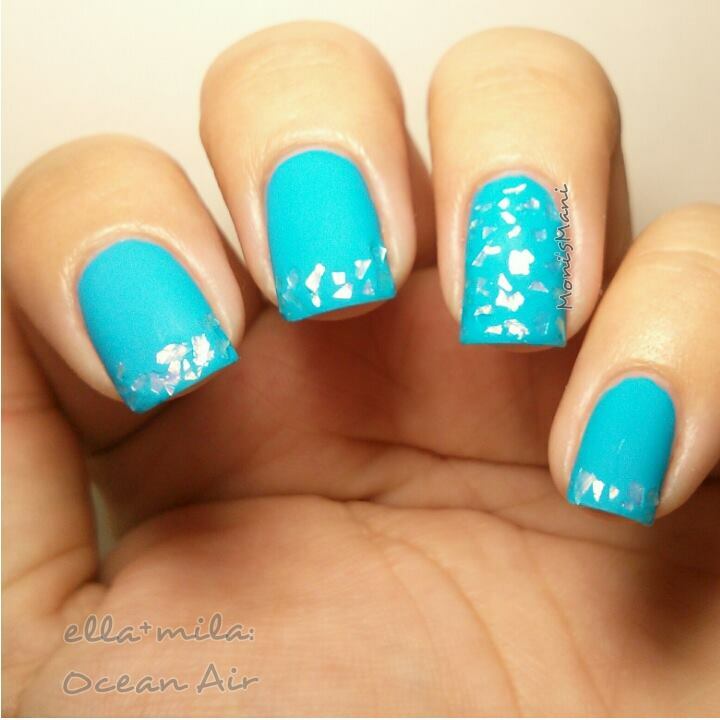 *ocean air– I am a blue lover, I don’t even need to confess it I think everyone who has ever seen my page/blog knows it. therefore… I LOVE this polish. 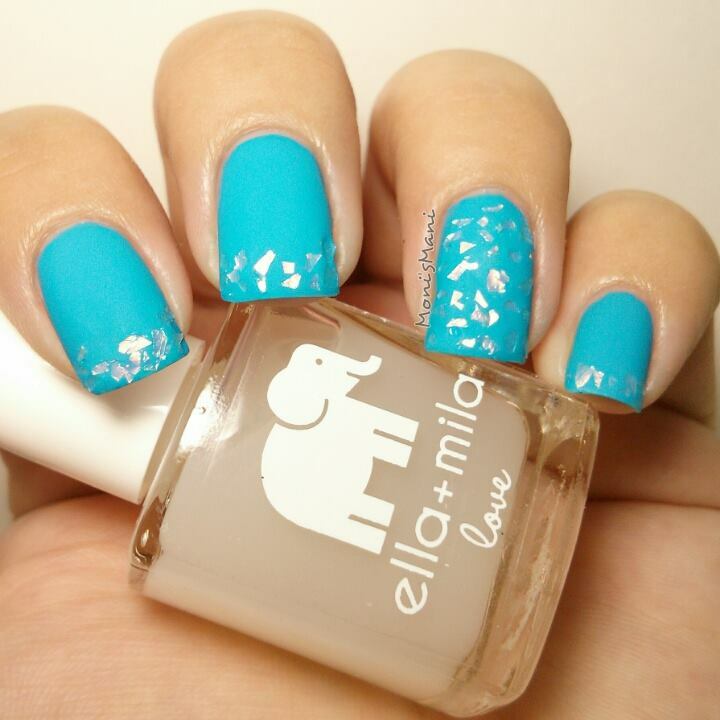 There is something I MUST say, there are a lot of blue polishes out there that look similar to this one, we have Sinful Colors Why not?, SC Jolt, Orly’s Skinny dip (this one with a touch of shimmer) and Zoya Robyn. these are the ones I’ve tried, they are all gorgeous, very similar colors with one HUGE problem, they all STAIN! I was warned about Zoya Robyn beforehand so I doubled on my base coat for it and even then it stained maybe 3 out of 10 nails? not so horrible I guess but the fact that it stained despite the doubled basecoat remains.. for this baby I sincerely forgot to double my base, and was absolutely dreading taking it off as it was on my nails for a couple of days. well.. there was NO staining! at all! not even a little bit! in my opinion, that is a HUGE advantage over all the others, and it’s ohh so pretty!!! 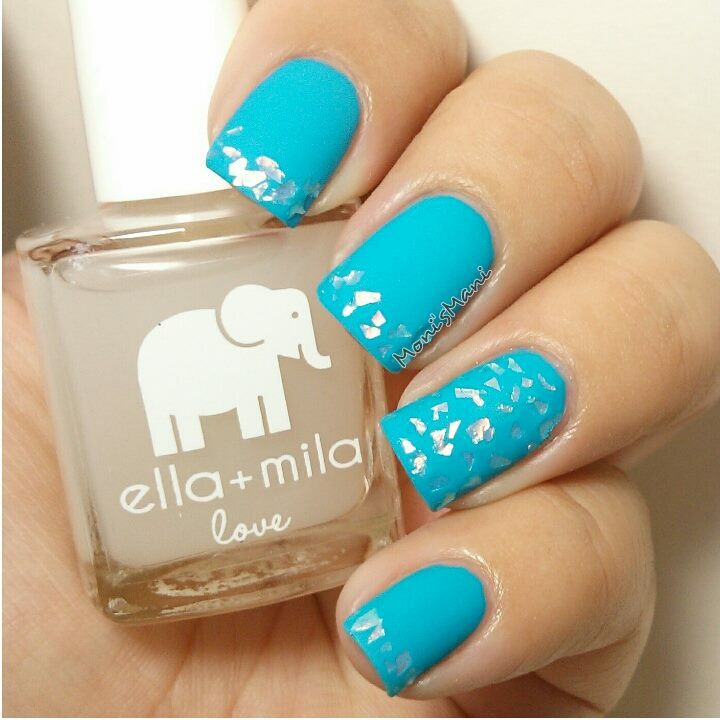 in the mani below you see two coats with some flake glitter placement and topped with ella+mila’s “Matte-ly in love” ( I will talk about this baby in soon!). So in love with it! 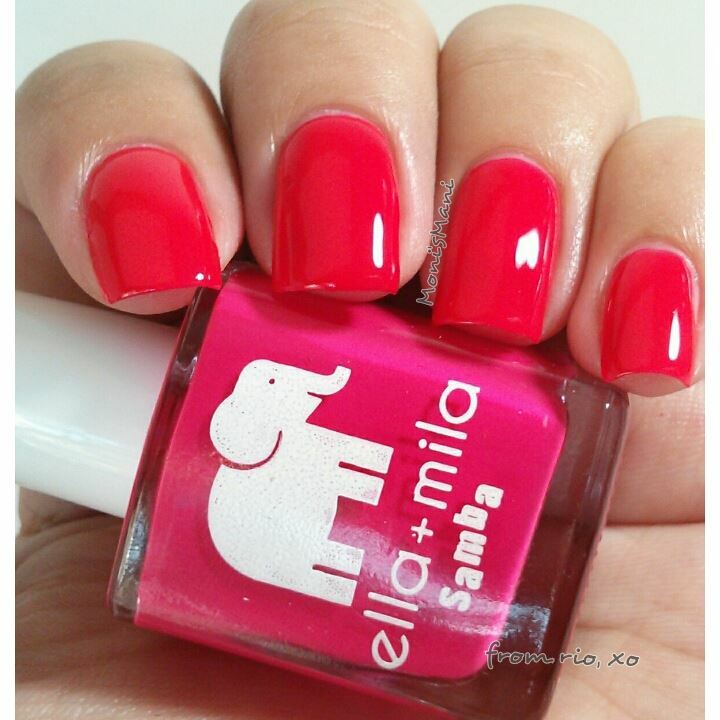 *from rio,xo- gorgeous color!! reminded me of a gummy raspberry!! soo beautiful and vibrant! Two coats of this crelly + top coat = i’m in love! if you are a girl who just loves to polish and isn’t into nail art, just want a polish to be carefree and gorgeous all by itself, this is it! you need not add anything else. if you are a girl who loves nail art, you might wanna touch it, I touched it very little, still in love. Having had the privilege of trying out 7 of their polishes (4 from before plus these 3) I have to say that this brand is one of my favorites if not my favorite indie brand. 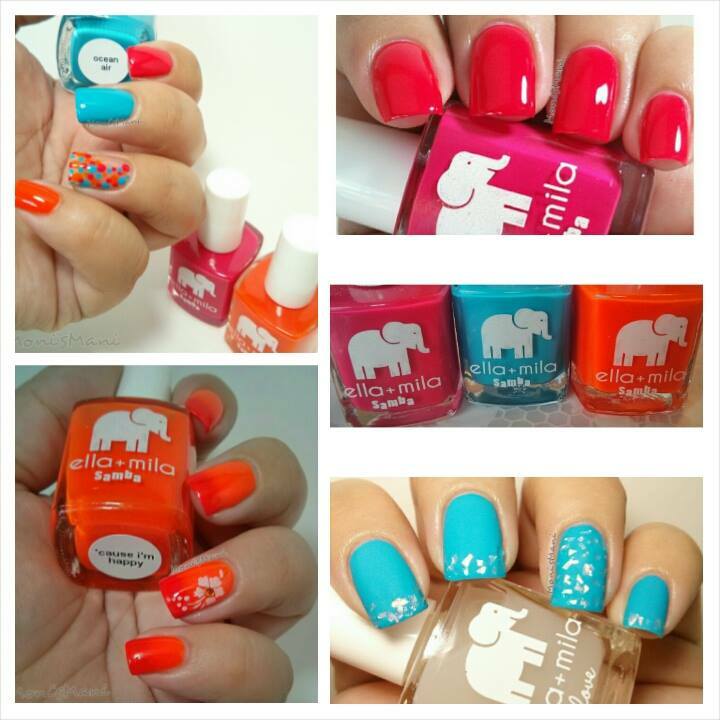 -Are 7 polishes enough to get an idea of the overall brand? Depends, in my opinion it is more than enough. If I were to pick for instance 7 Essie’s from my collection, I’d tell you they’re very irregular and hit or miss because at least 2 of them have dried and become goopy within a couple of months, or that the formula on some of them wasn’t the best, I don’t think I’d have a complete 7 out of 7 amazing ones from any of the other brands I own. Ella+mila polishes have so far proven to have very flowy formulas, great drying time, beautiful shades, no scents, I would definitely recommend them! Thank you sooo much for taking the time to read this! and thank you Ella+mila for trusting me with your pretties!!! These pretties are vegan, 5 free and cruelty free (they are even PeTA certified) which makes tiny (and not so tiny) manicures so much safer! No problem, I’ll let you know!